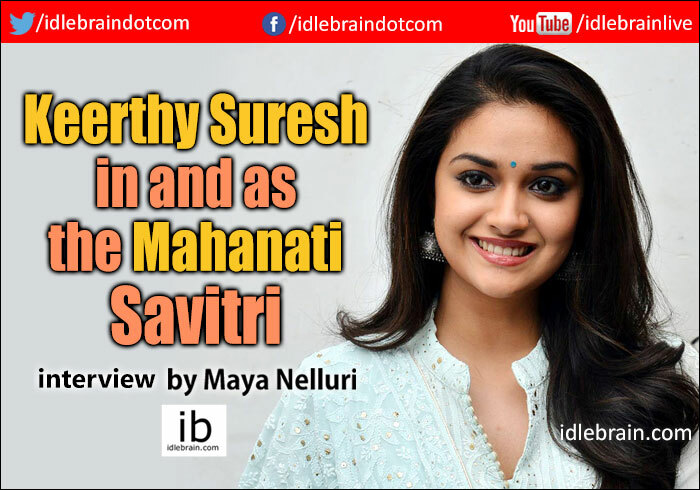 Going by the photos and trailers of Mahanati, there is no doubt in anyone’s mind that Keerthy Suresh was the perfect choice for the role of the eternally beautiful Savitri. Looking at some of the photos released it is difficult to tell Keerthy’s pictures apart from the originals, a truly impressive task. And we cannot wait to watch the life of the legendary actress come to life on screen. For now though we have the leading lady of Mahanati with us to give us the inside scoop into how she came to be Savitri. You started out as a child artist; was it a big jump to go from that to main lead roles? I acted for my dad’s movies so it was more like going on a vacation. I’d be on set and say that I wanted to act so they’d give me a role. *Smiles* It wasn’t too serious. But when it comes to being a lead actress, it is a totally different ball game. The camera wasn’t new to me so wasn’t shy about people being around while shooting. I never had the fear. Whether it was intentional or unintentionally, being a child actress helped a lot. What do you say to others who think that you’ve had it so much easier because both your father and mother are from a film background? Of course those without film connections have to work much harder to get into the industry. To get a start is not easy. For me coming into movies was really easy but to stay here is not easy at all. Whoever you are, regardless of who your father or mother is, nothing matters. You and what you bring to the plate is all that matters. My launch into the movie industry was because of my parents; but staying in the film industry was because of me. You have to work hard whether it is getting in or staying here. The way I look at it, those without film connections have a different type of advantage. Because they’ve had to strive to get in, they experience the pressure early on and they learn the ropes so they find it easier to stay in the industry. For me it was the other way around, to stay here I’m working harder every day. You’ve come a long way now. Playing the legendary actress Savitri is no small feat. How did it all happen? It happened just like that, I hadn’t planned it. The director Nag Aswin and producer approached me for this movie. Initially I said no because it’s not an easy role. And I thought that at this point in my career it might be too early to do this sort of a role. I also had some doubts about the possibility that it might become controversial. But the director convinced me that the story of Savitri garu isn’t something unknown to the audience. Mahanati was to be just facts! He was quite convincing. Nag Aswin told me that he saw Thodari (my Tamil film) where I play a similar role to that of the character in the beginning of this movie. My character was innocent, young and fresh, just like what he wanted. Recently he said in an interview that he saw something in my eyes that convinced him. *Smiles* Still, I took a long time to think about it and then moved forward. I thought that if someone else has so much confidence in my ability to do this then I should have faith in myself as well. How was the experience of playing Savitri garu? It was not a joke. You have so much to live up to. It was an unforgettable journey and experience because it was not like any other character I had ever played. It wasn’t like you just show up to location, change into costume and go on set. Savitri garu is a part of us. Today even though it’s been a while since the shoot wrapped up, I still find it difficult to snap out of character. Also, there were a lot of emotional and physical aspects which I had to prepare for. We shot for more than 100 days over 10 months. We started with a look test, then shot day and night, had over a 100 costume changes, and every day we had to be perfect with our makeup and hair. For some parts prosthetics had to be used so I had to undergo a lot of stress; that process is physically stressful. Tell us about the role itself. There’s two main parts to the movie. In one we replicate some parts of Savitri garu’s movies where we show her growth and her peak, her golden period. But mainly it’s about Savitri garu as an individual. It’s about her life off-screen. We had to do a lot of research. Today, after about 40 or 50 years there’s a lot of interviews and personal details we had to dig up and pour through. People know her professional career but there is very little to go on to know her on a personal level. We had to talk to a lot of people from her life to get that aspect out. I used to talk to her daughter Vijaya garu a lot. She explained to me her characteristics and so many other things. Talking about this, I remember one particular interview where Savitri garu seems particularly playful, and spontaneous; she talks from the heart. All these things, her biography and a lot more put together formed Mahanati. Over a 100 changes is not a simple task, tell us about your look in the film. Most of them were sarees done by designer Gaurang. They were exclusively made for the movie. The jewellery also had to be specially designed because the designs of those days are not so common now. Also, it wasn’t just about my look in this film; every single character had to be carefully crafted. Be it their hairstyle, accessories or outfits. Indrakshi, the stylist took care of much of it. How do you feel about playing Savitri garu? It’s definitely a major change from my previous works. I’ve never done something like this before, neither a biopic, nor a woman centric movie. And I’ve never worked so hard on a film so I’m sure that this will be my best movie yet. How was it working with director Nag Aswin? He is a very chilled out director, not at all fussy. He lives in his own world, always calm and composed. He is very cool to work with. Initially I was thinking that a director making a biopic might be difficult to work with but he really wasn’t so rigid. When it came to dubbing it was a totally different story. He was really particular about dubbing. He’d say that people are very protective about Savitri garu and how she spoke Telugu. Coming to his storytelling, screenplay and filmmaking style, they are really great. I’m very excited about the release. You are working with Dulquer Salmaan in this film. How was it? Dulquer is a childhood family friend. My mom and his dad did more than 20 movies together. And my dad and his dad worked on films together. We all know about Gemini sir whom he is portraying in the film. His character has shades of grey. Whatever is shown is not something new. It could happen to anyone. Dulquer is a terrific actor. Inevitably when you watch the film you will get attracted to him. For a star like him to take up that role and portray it was inspiring. Same with Samantha. She took on the role knowing that the lead is being done by another actress. I don’t know if I’d do it if I was in her place. We needed a star like her to drive the movie, so it was great to have her and it worked really well. Vijay is also a fine actor and their chemistry is very interesting in the film. I really don’t know. I haven’t signed anything after this in Telugu. I’ve got to be very careful in choosing my films. I want to get the right balance between doing commercial and concept driven films.